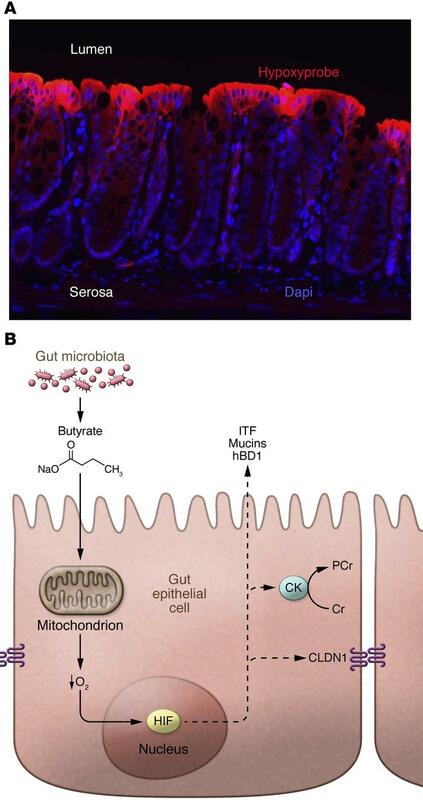 Physiologic hypoxia and barrier regulation in the healthy intestinal mucosa. (A) Localization of low pO2 along the crypt-villus axis and the presence of “physiologic hypoxia.” Colonic mucosa of healthy mice retain small amounts of nitroimidazole adduct (Hypoxyprobe) that is detected along the luminal aspect of the colon (red). Blue depicts nuclei counterstaining with Dapi. (B) A mechanism in which microbially derived SCFAs, such as butyrate, elicit increased O2 consumption to the extent that HIF is stabilized and transcriptionally active. Also shown here are barrier-related pathways that are directly regulated by HIF. (Cr, creatine; PCr, phosphocreatine; HIF, hypoxia-inducible factor; CK, creatine kinase; CLDN1, claudin-1; ITF, intestinal trefoil factor).